SHANGHAI — The PGA Tour has its first Chinese members, and now has reason to believe they won't be the last. "These will be brand new tournaments, providing players with more opportunity to participate, as well as to establish a route for China golfers to get through and into the world stage of golf," said Zhang Xiaoning, president of the CGA. 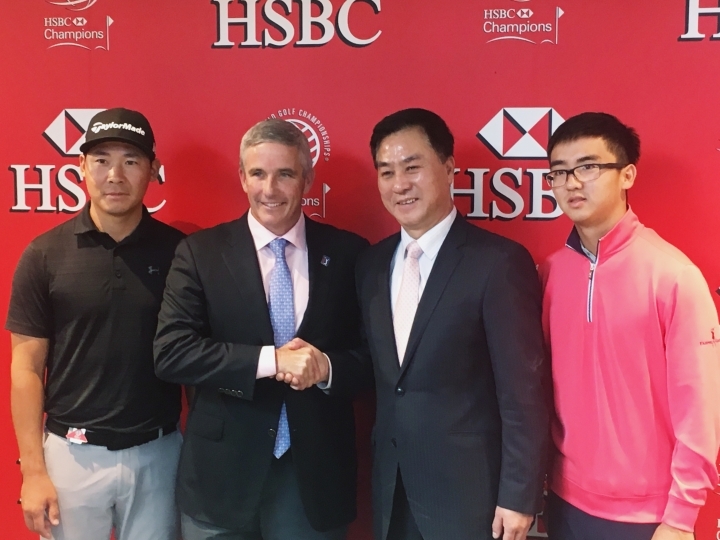 "The development of golf tournaments here is not only helping the tour itself, but also to help China develop better and more professional golfers and to raise the interest of our citizens to the sport of golf." Li Haotong played the China Series in 2014, and a year later he was one shot out of the lead going into the final round of the HSBC Champions. Under enormous pressure from the home crowd, he didn't make a par until the seventh hole while playing alongside Jordan Spieth. He tied for seventh. "As soon as I walked onto the first tee, everyone was speaking Mandarin to me — 'Haotong, play well, good luck' — my mind was lost," he said Tuesday night from the roof of a hotel in downtown Shanghai, where he took part in a promotion with Dustin Johnson, Henrik Stenson and Hideki Matsuyama. "I learned a lot from that." "We are looking forward to strengthen the development of the sport of golf in China and to hopefully provide them with not only a better platform to develop but also to gain more opportunity to strengthen their skills to have better performances in major international sporting events," Zhang said. "They followed the path from PGA Tour China to the Web.com Tour to the PGA Tour, and they are ideal examples of what you can do when you have immense talent, you dream big and you play on PGA Tour China," Monahan said. "PGA Tour China was really important for me," Li said. "I grew up from nothing to playing the Web.com. It's a really good tour. It's helpful for China golf."